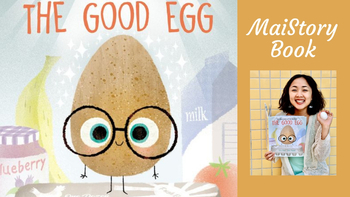 This is the FREE video portion of the guide to a shared-reading read aloud of “The Good Egg” from the MaiStoryBook Library Collection. An interactive reading experience that occurs when children join in or share the reading of a book or other text while guided and supported by an adult or older experienced reader. The experienced reader explicitly models the skills of proficient readers, including reading with fluency and expression, and engages the child in dialogue throughout the book. The goal of MaiStoryBook is to spotlight children’s illustrated books, as well as provide resources for parents, families, and teachers to inspire in children a love for books and a curiosity for the world of reading- all through a series of MaiStoryBook collections.